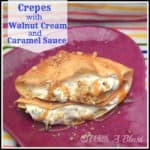 Crepes with Walnut Cream and Caramel Sauce is the ideal dessert to serve when entertaining – or serve as an everyday dessert ! Seems I am on a crepe/pancake run at the moment ! 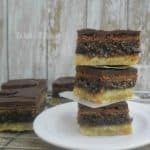 We had these as dessert and I made way too many, and because of that, ate way too much!